Blinged out Converse for Wedding. Every bride wants a wedding day that is filled with things that mean something to her and her husband to be. From the choice of music to the dishes on the menu, each decision, no matter how small, is a reflection of both of their personalities. And with so many options surrounding how you can get married, whether it’s a traditional church wedding or something more unusual (think a wedding on a fishing boat, Don’t Tell The Bride style), individuality is the key for most couples. Gifting is becoming more personal too, with brides opting to give their bridesmaids each an individual lipstick in their favourite colour presented in a little makeup bag that has their name on the front, while groomsmen are receiving cufflinks with the wedding date and their wedding title on them. Naturally, your whole outfit will be personal to you. Your dress will be the one that is perfect for you – the dream dress – and your jewellery is likely to have a sentimental value. But you could take personalising your aisle style one step further. Embrace your new title with our Wifey for Lifey blinged out Converse for wedding. 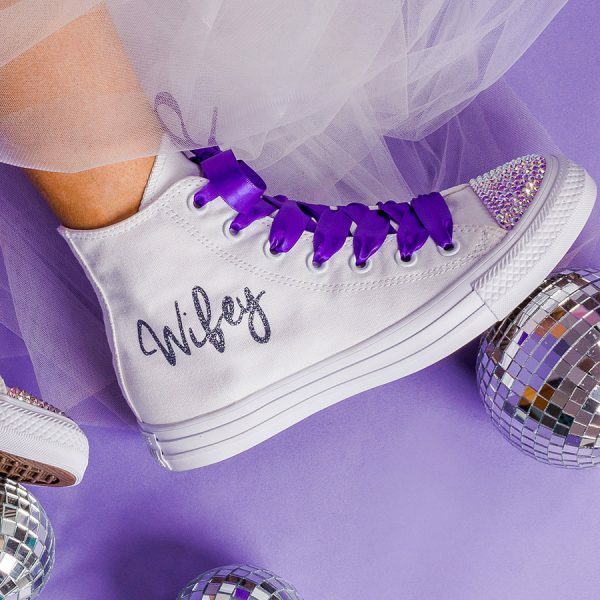 Inscribed in pretty calligraphy type with the word Wifey, Mrs or Bride, these comfortable alternatives to heels will see you gliding effortlessly down the aisle, strutting your stuff as you mingle with your guests and still standing (or dancing!) at the end of the evening reception. 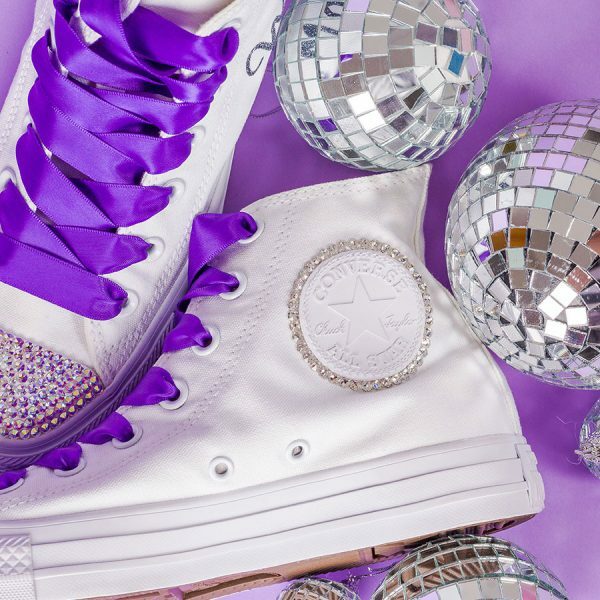 Customise you own pair of blinged out Converse for wedding to suit any colour scheme or theme with five options of Converse, 12 options of ink colour for the text and 11 colour options for the satin ribbon laces. No bridal shoe would be complete without a bit of bling, which is why you have the option to add Swarovski crystals in a choice of 11 colours or cream pearls to both the toe cap and around the Converse badge, adding just the right amount of sparkle – the unicorn rainbow crystals (shown in the picture) is the winner for us! Why not gift your girls a similar pair with colour co-ordinating laces too? Check our other custom Converse for more inspiration.